If you search of other 500 hour yoga teacher training programs, you will see tuitions in the $4,000-$8,000 range. As a nonprofit, Yoga Farm seeks to offer very high quality personal and professional training programs at as low a tuition as possible. The training tuition for each 37.5 hour module is $375. You will be certified as a 500 hour yoga teacher when you complete 8 modules within 3 years. You can take the modules at any pace you’d like. 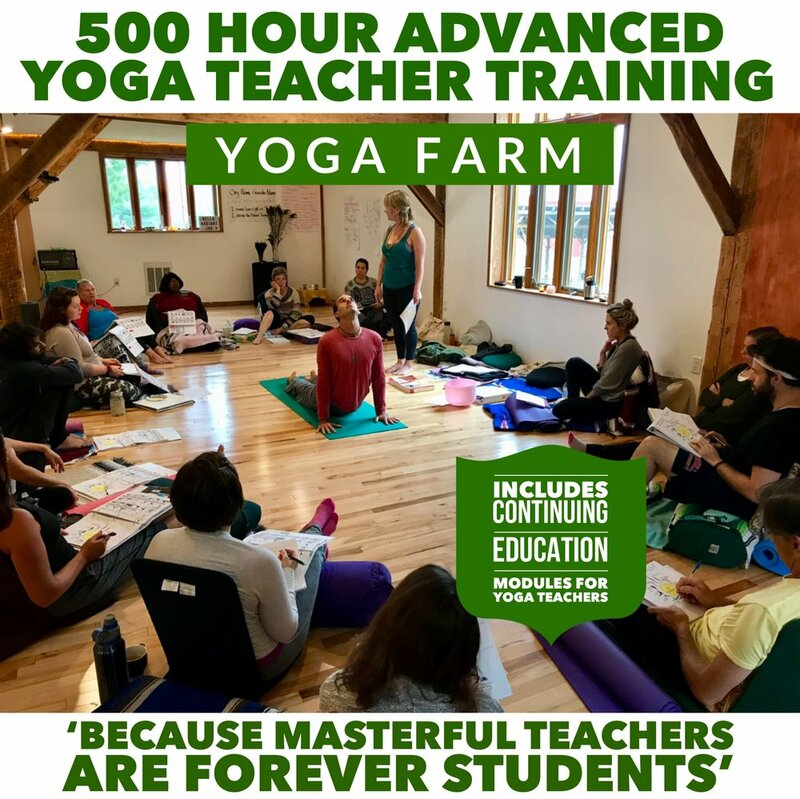 You are required to be a Yoga Farm member to be eligible to join the 500 hour yoga teacher training. The ‘Supporting Membership’ is $470/year, or $47/month. You are welcome to consider a higher membership level, which includes a contribution to our ‘Connection is Healing’ and ‘Sacred Sundays’ programming. The 500 hour yoga teacher training program includes unlimited yoga classes, community connection via our private group, support for your practice, teaching and business throughout your training. The total tuition if you complete 8 modules in 1 year is $3,470. If you continue into a second or a third year you simple need to maintain your membership and you can continue to take modules as you would like ti. SPECIAL! We have a ‘8 module discount’ for $2,999, including a 1-year membership - good only for the first 10 paid-in-full applicants to our 500 hour yoga teacher program. You may also join the 20-hour version of module by itself as continuing education for $229 each. This variation includes pre-weekend zoom call, and the 2-day weekend training only. CEU weekends are for ‘educational / immersion purposes’, and don’t include a teaching certificate, the third day of practice and teaching practicum, the followup zoom call, or the self-paced teaching project and support. CEU weekends are eligible for credits with Yoga Alliance, and do not count towards the 500 hour yoga teacher certification. We are committed to making our curriculum available to as many students as possible. If you have concerns about fulfilling any of the above payment options, please contact us and we will work to find a mutually suitable option for you. For those who are interested, we have one need-based work-trade scholarship available—please inquire for details. The scholarship may involve partial tuition, food preparation for group meals, studio cleaning, work on the farm and gardens, or other work-trade tasks suitable to the student in service of our center.